seeing is believing. This idiom seems to be very significant in the light of recent revelations on numerous children dying because of World Health Organisation's (who) blind acceptance of wrong information. Researchers from who and United Nations Children's Fund (unicef) recently analysed vaccination data for the past 20 years and found that children worldwide have been dying because, for decades, who has relied on vaccination coverage data that is intermittently unreliable and sometimes wildly wrong ( newscientist.com , November 26, 2001). The researchers found that, at times, vaccination statistics get replicated while records are being made. This results in over-estimation of the occurrence of diseases in some areas. Consequently, while making schedules for the future, more vaccines are allocated for these areas than what is required. As an outcome of this, areas that actually require the vaccines end up getting none. "If your data is over reported, you may not be paying attention to a problem area and kids who normally would have got vaccinated will get a disease and die," said Anthony Burton of the vaccines division of the who. "We discovered that 25 per cent of data was simply missing and 19 per cent was information that had unusual jumps or inconsistencies," added Burton. For example, they found that a large percentage of children in Bangladesh were given the third dose of diphtheria, tetanus and pertussis vaccine in one year. In Sierra Leone, vaccine take-up supposedly jumped from 28 per cent to 68 per cent between 1997 and 1998. The problem is not limited to developing countries, the researchers found. To their utter despair, they even discovered that no data was available from Norway. "National level immunisation coverage values are a myth," opined virologist T Jacob John, advisor to the Indian state of Kerala. According to him, year after year India reported vaccinating hundreds of thousands of children against polio, but these figures were much more than the number of doses the country purchased. What is more, independent experts say this has been going on since the 1970s. "Everybody knows about it," says Pierre Claquin, an epidemiologist working in Bangladesh. 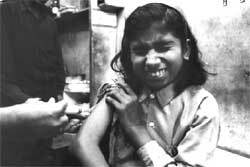 There, the reported figure for measles immunisation in 1999 was 96 per cent, as compared with 61 per cent from an independent survey.